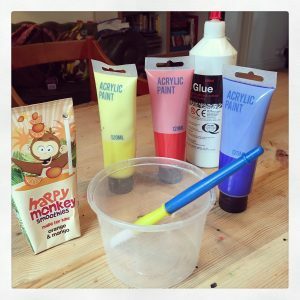 Introducing our new monthly Captain Cookie craft blog with crafty ideas to keep children’s minds inspired and hands busy. 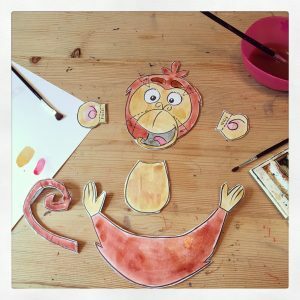 Captain Cookie runs the Happy Monkey sponsored craft rooms at London Big Fish Little Fish family raves, that run all across the capital and now up and down the country. 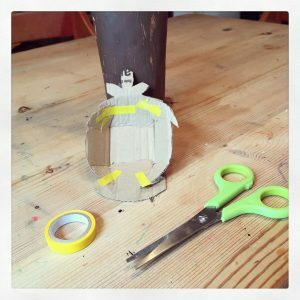 With the Easter holidays upon us it can be difficult knowing just how to keep little minds and hands active. 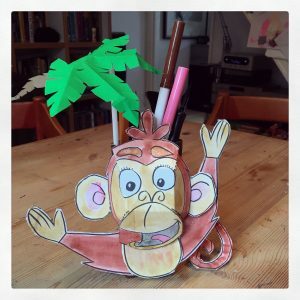 Which is why we’ve come up with this great way to make a fantastic jungle penholder. 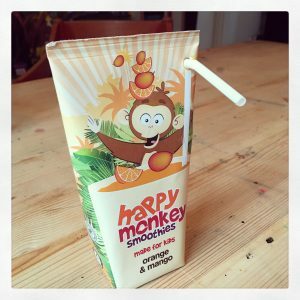 To get started you require an empty Happy Monkey carton as that’s the key piece of material! 1.) 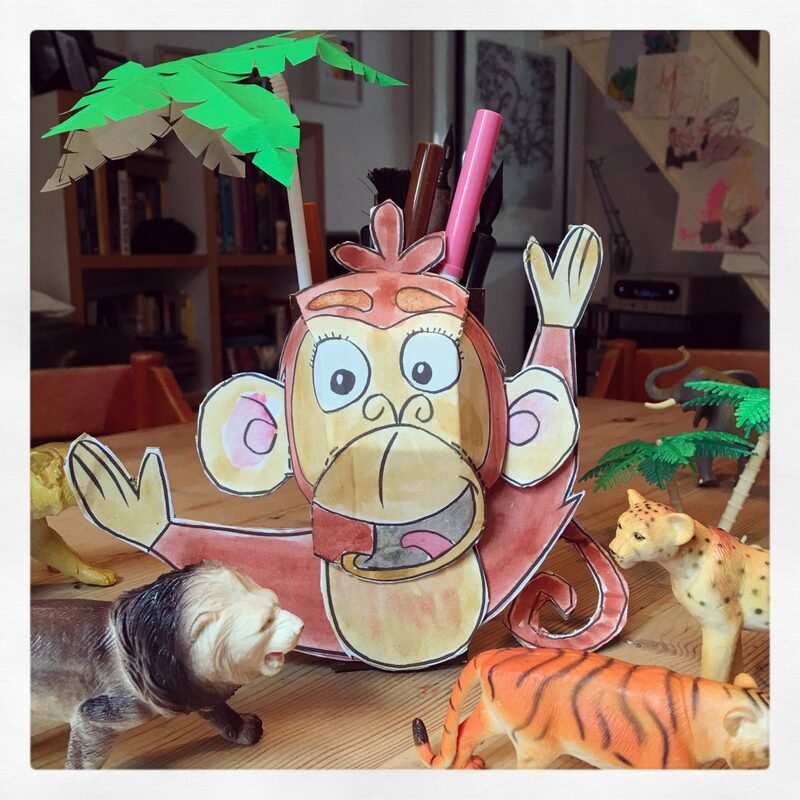 Remove the straw from your used Happy Monkey carton and keep safely to one side. Cut the top off the carton and wash thoroughly and dry. 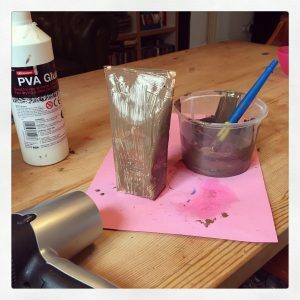 Paint the outside of the carton in brown acrylic or poster paint (you can add PVA glue to make it thicker and stick better). You will need to apply 2 coats, so a hairdryer may be useful to speed up the process. 2.) 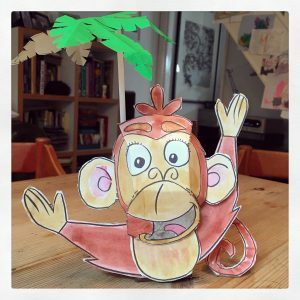 Print out the .pdf image Happy Craft Monkey and glue onto thin card and carefully cut out (you may need an adult to help). 3.) 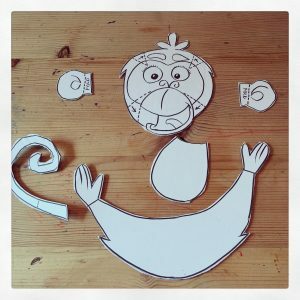 Colour in the cut out crafty monkey pieces either with watercolour paints or felt tip pens. If you are feeling very adventurous you could use rolled up small balls of tissue paper. 4.) 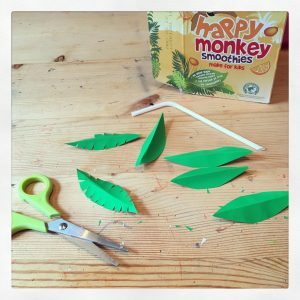 Cut out x6 long oval palm leaves from green coloured paper and cut small V shapes to look like palm leaf fronds. 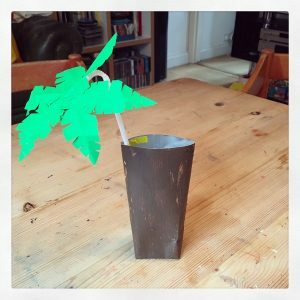 Glue or double-sided tape onto the end of your straw and carefully secure inside your painted carton. 5.) 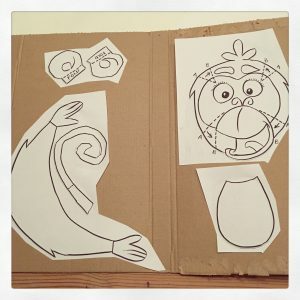 Cut down the 4 x dotted lines ‘B’, bring line ‘A’ to ‘B’ and secure with glue & tape inside. Tape on the ears at the side of the head and fold forward. Fold forward the tuft of hair on the top of the monkey’s head. 6.) Double-sided tape the chest on top of the arms and secure to the carton at the bottom. Secure the head on top of the arms and chest. The tail to be stuck on the back of the carton. 7.) 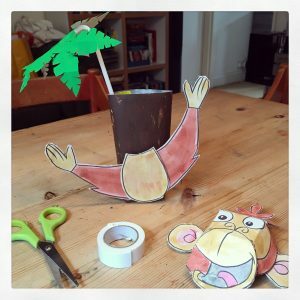 Now you are ready to fill the carton with your favourite pens, brushes and scissors ready for a Jungle adventure. 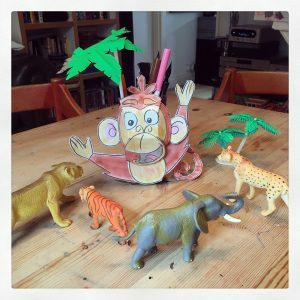 To create the perfect Jungle birthday party or holiday activity have a look at Captain Cookie’s large colouring wall murals – perfect to go with your happy monkey smoothies. They’re available at Etsy.